One of the most influential jazz singers of all time, Billie Holiday was born Eleanora Fagan, in Baltimore in 1915. Her father was a guitarist during the earliest days of jazz; his frequent absences led to her parents’ separation. As a girl, Holiday ran errands for a neighborhood whorehouse; there, she heard jazz recordings of Louis Armstrong, and the blues music of Bessie Smith and other great singers of the period. She was still a child when she started calling herself Billie Holiday. Her mother opened a boarding house when Holiday was ten. When a boarder raped Holiday, she was accused of causing the attack and was sent to a Catholic home for children. A few years later, Holiday’s mother reclaimed her daughter and moved with her to New York City. They struggled to survive; when she was fifteen, Holiday was arrested for prostitution and sent to jail. After her release, she chanced into a singing job at a club. Holiday was an immediate sensation and was soon performing with the best musicians in the city. Her sophistication and style earned her the sobriquet Lady Day. With an incomparable sense of phrasing and tonality, Holiday reinvented familiar tunes, revealing hidden depths in even the slightest compositions. She began to make successful records, increasing her considerable popularity. Eventually she would make numerous influential records such as “Strange Fruit,” a song about southern lynching that she made famous in her shows at New York’s Café Society Downtown. She became one of the most popular singers in the Harlem clubs and she also traveled to Chicago and California. She toured with the Count Bassie orchestra, but she became bitter about the discrimination she faced on the road, and eventually gave up touring. Through much of her career, Holiday struggled with drug addiction. In 1947 she was arrested for possession of drugs and sent to a reformatory for a year. After being released, she was denied the cabaret license necessary to perform in most New York clubs. She was forced to travel to perform, though she hated life on the road. When she was forty-four years old, Holiday died of cirrhosis of the liver, kidney failure, and cardiac arrest. In spite of his disappointment, Van Vechten began photographing Holiday. It wasn’t going well and he was considering giving up when he thought to show Holiday his photographs of Bessie Smith. The photographs brought Holiday to tears; she explained that Smith had been an inspiration to her in the early days of her career. Their discussion of Smith softened the mood, and Holiday agreed to wearing a drape fashioned to look like an evening dress instead of her suit for some of the photographs. At midnight, Holiday announced that she had to go home; she promised to come back shortly. Van Vechten, afraid she might go in search of drugs, sent his assistant Saul Mauriber to Harlem with her to insure her return. Holiday and Mauriber reappeared with Mister, Holiday’s boxer. She was in a different mood entirely, more lively and relaxed. 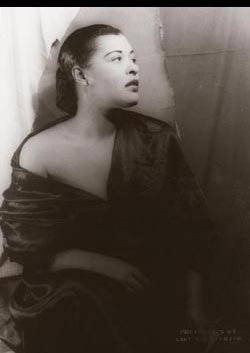 Van Vechten continued to photograph her for some time.